Problem with ThinkPad: You need to see Mr. Ritter in the media center. He holds regular office hours between 8:30 a.m. - 10:30 a.m. every school day. You will need a pass from your teacher to go and see Mr. Ritter. What Makes A Rollercoaster Work? Wednesday, October 18 and Thursday, October 19. Make sure you take home your report card. Even if I didn't see you today, I emailed your parents/guardians to let them know that you received your report card during Enrichment today. 4. Homework: Practice designing a roller coaster. See websites above. 3. HOMEWORK: You should have no homework this evening. 3. Could you please check your science grade? There are quite a few of you with missing assignments. d. Begin roller coaster MLA paper - Yes! You must be able to write in science class. 1. Do Now - get it done please! 1. Do Now - complete it! Video #1: Nova Roller Coasters - You are only going to watch the first 17-minutes. This is posted right underneath the homework for today. ​Remember, you are only watching the first 17-minutes. Video #2: Discovery Roller Coasters - You are going to watch segment 1, segment 2, and segment 5 only. You will need to click on the videos below to watch each segment. I have these segments posted beneath the first video. 3. Roller coaster paper. See guiding questions beneath all the videos. Yes, you need to write your third paragraph. 4. Turn your video worksheet into the teacher. 5. HOMEWORK: NONE, unless you do NOT have at least three paragraphs typed. d. Study review guide when you have completed it. e. Review your vocabulary over this section. 4. Time to work on your roller coaster paper! You will type paragraph 4 in under 10-minutes. a. Peer Edit Paragraph 4 . . . I will randomly select your peer for this paragraph. b. Complete Peer Edit form. 5. HOMEWORK: You have TWO things to finish BEFORE next class. First, you must have paragraphs 1, 2, 3, and 4 DONE! Second, you must have the review guide completed! I will post a review test by 4:00 p.m. today. Make sure you PRACTICE for the Work, Energy, and Power test. b. Turn in review guide AFTER the test. c. Turn in anything else you have missing! d. No paper portion of the test. 3. Paragraph 5 - The last paragraph of your Roller Coaster paper. LATE. Remember, LATE means 50% and then I start to grade it. What is a roller coaster? Who is credited with making the first roller coaster? When was the first roller coaster available in the US? When did steel roller coasters make their debut? Paragraph 2: Design Your Own Roller Coaster - Answer all prompts. You might need to make this two paragraphs! What did you learn about hill height when you completed these online activities? What did you learn about loops when you completed these online activities? What did you learn about your coaster’s “fear factor”? What did you learn about roller coaster safety while completing these online activities? At what point on a roller coaster is the rider at maximum height? 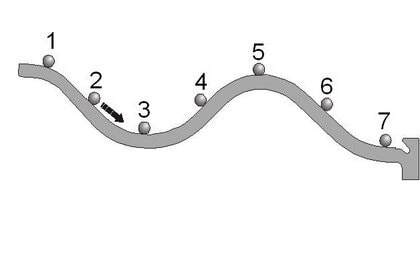 Why does the first hill of a roller coaster have to be higher than all the other hills, twists, and turns? How does Newton’s Third Law and centripetal force relate? Why don’t roller coasters derail? Paragraph 4: Roller Coaster Lab - This paragraph is a summary of what you learned while doing the roller coaster lab. Copy and paste the CPO roller coaster into your paper BEFORE writing the rest of your paragraph. The image you are to use is below. Define and explain potential energy, then identify on the roller coaster where the greatest potential is located. Define and explain kinetic energy, then identify on the roller coaster where the greatest potential is located. Where on the roller coaster coaster is kinetic energy converted to potential energy and vice-versa? These are the guiding questions for students that have ridden on a roller coaster. Estimate how many times you have gone on a roller coaster ride. Pick one roller coaster you have gone on and write why you rode on this roller coaster? Did you like riding the roller coaster? Yes or No. Explain why you like it or didn't like it. Will you continue to ride roller coasters in the future based on what you learned about potential energy, kinetic energy, and centripetal force? These are the guiding questions for students that have NEVER ridden on a roller coaster or you just watched your friends ride on the roller coaster. Which roller coaster looks the most exciting and where is it located? Why does this roller coaster look like it is exciting? Besides the safety bar/harness and wheels on the top and bottom of the rail, explain why people do NOT fall out of this roller coaster. If given the opportunity to ride this roller coaster in the future, would you ride it? Yes or No. Explain why you would ride it or why you would not ride it. Quick Checklist. Go through your paper and make sure you have completed these items. 1. Paper is headed correctly using MLA format. 2. Title is centered on paper. You can use Roller Coasters as a title. The title doesn't need to be flashy. 3. Entire paper is double-spaced. 4. Entire paper is typed on Arial or Times News Roman font. 5. Entire paper is size 12 font. 8. Put a period at the end of a sentence unless it is a really exciting sentence. If the sentence is really exciting, use an exclamation mark! 9. SPELL CHECK! SPELL CHECK! SPELL CHECK! SPELL CHECK! SPELL CHECK! 10. You have at least five paragraphs. 11. The paragraphs are based on the guiding questions provided. 12. Your paragraphs make sense when you read them. 2. Check your email for you Do Now score. I'm recording this Do Now as a grade. 2. Calculate velocity, frequency, and wavelength using the velocity wavelength formula. ​ b. Worksheet 2 - You need the worksheet and this oscilloscope! c. Collect both worksheets - STAPLE them before turning in to the basket! 4. HOMEWORK: Just make sure the Quizizz activity is DONE! 2. Put graded papers in your science folder. 3. Complete 17.3 Notes: Interference and Standing Waves. You will get a worksheet to take these notes on in class. You will need to use the presentation to complete these notes. Make sure you use the presentation in PRESENT mode so the videos will work! Write ALL of your answers on the worksheet given to you in class! 5. Complete the ICP - Wave Test Review worksheet. This is your review guide. It is going to be worth 20 points. I will collect this worksheet AFTER you take your test. ​6. Homework: Your Wave Test is the very next class! 2. Wave Test on Rose-Prism. You may use your notes and review guide on the test. 5. HOMEWORK: Heat Vocabulary. Due at the start of next class. 3. Finish notes on Absolute Zero, Latent Heat, etc. 3. Prepare for the FINAL. Yes, you have a comprehensive review guide! ​4. HOMEWORK: STUDY for your final by completing the comprehensive review guide! 2. Work on ICP Semester I Study Guide. 3. Start going over answers. I'll get through as many as I can before the end of class. 4. HOMEWORK: STUDY your study guide after you complete it. 3. HOMEWORK: STUDY! After you complete the review guide, make sure you go back over that review guide and actually read what you wrote. Study with a partner on the vocabulary words.